1) You will learn real horseriding, like you can't learn on any other place! Our guests go the gambit from complete beginners to incredibly experienced riders. We can teach you to ride like you never dreamed possible - in only 4 days - not years and years. What you will learn and do in horse riding and horsemanship is quite amazing and we are very proud that we can do this. 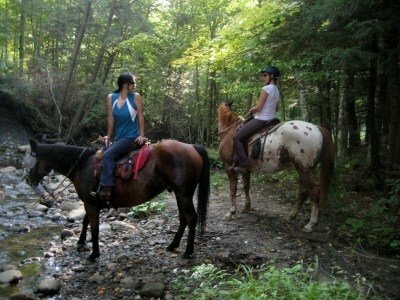 You will be amazed at your confidence and your skills that you've achieved in the 4 days here at Adventure Horse Riding in NYS. We are able to do this because we take only 2 persons per 4 day session - there are no large groups competing for attention. We intentionally stay small and focus only on you - exclusively - your desires, needs, fears - you name it and we try out best to do it. And, we love what we do ! We have incredible terrain here - you'll be climbing hills, sliding down hills, crossing rocky creeks, going thru deep mud and water; it is extremely varied from very easy to very difficult. You and your little darling will be together from about 9 to 5 or 6 - with a 1.5 hour lunch break when you can eat, rest, nap, think or whatever. This is what "real horse riding" is all about - outside and in the woods - no arenas or going round and round in circles. It would take you near 5 years to become this accomplished - really and truly. You will learn how to ride at all speeds and gaits, go over all kinds of terrain, learn how to communicate and understand the needs of the little darlings, develop skills to deal with rodeos (when a horse acts up), and on and on and on. At the average lesson price of $60 an hour times52 weeks a year times 4 years, you wold have spend over $15,600! Are you kidding? And you still wouldn't have learned to do real horseriding!